Members, don’t forget to complete your NAIS Animal Premise ID Form. Click here for the form from the Florida Department of Agriculture. 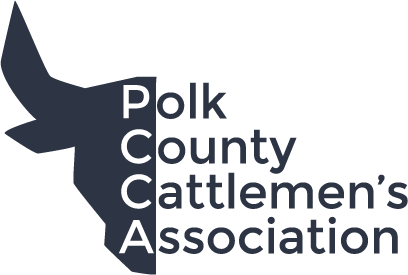 To subscribe to the Polk County Livestock Report newsletter, please email your Livestock Extension Agent, Bridget Carlisle at bccarlis@ufl.edu. Six cow herds with long calving seasons were converted to a short season. Average calving season was reduced from 273 days to 85 days. This resulted in 92% of cows calving in the desired season compared to 46% before the season was shortened. The average time taken to arrive at the shorter season was 3.8 years. One objection raised by some to shortening the calving season is that cows have fewer opportunities to breed and therefore fewer will calve over a year with a short season. Cattle producers depend on various services and products in their ranching operation, but sometimes it is difficult to locate a service provider or product. The South Florida Beef Forage Group has developed an extensive “Service Provider Directory” to help ranchers find what they need while allowing service and product providers market themselves. The directory includes providers in various categories that include, but are not limited to: hay, grass planting material, day workers, custom tractor work, hauling/transport, welding, fencing, to name a few. Providers are listed by category then county. Visit the website at sfbfp.ifas.ufl.edu/ or contact me at (863) 519-8677 Ext. 104. If you have a service or product that you would like to list in the directory, please call me at the number above or email me at bccarlis@ufl.edu and I will be glad to have you added to the list. Polk County’s Sheriffs Department recommends ear marking, ear tagging, or branding your cattle for identification of lost or stolen cattle. “COOL” is in mandatory effect now. It should not hinder your ability to market your cattle. When taking cattle to Livestock Markets, you may be asked to sign an affidavit to prove that they are U.S. born and raised.